The 74LVCH16541A is a high-performance, low-power and low-voltage Si-gate CMOS device and superior to most advanced CMOS compatible TTL families. Inputs CAN be driven from either 3.3 V or 5 V devices. In 3-state operating, outputs CAN handle 5 V. These features allow the use of these devices in a mixed 3.3 V and 5 V environment. The 74LVCH16541A is a 16-bit Buffer Line Driver with 3-state outputs. The 3-state outputs are controlled by the output enable inputs (1OEn and 2OEn). A HIGH on nOEn causes the outputs to assume a high-impedance OFF-state. 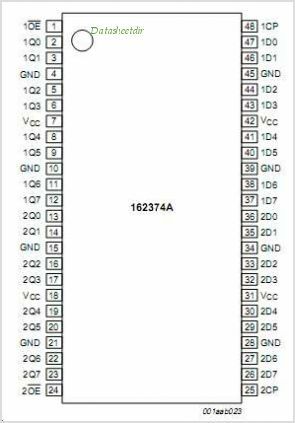 This is one package pinout of 74LVCH16541A,If you need more pinouts please download 74LVCH16541A's pdf datasheet. 74LVCH16541A circuits will be updated soon..., now you can download the pdf datasheet to check the circuits!